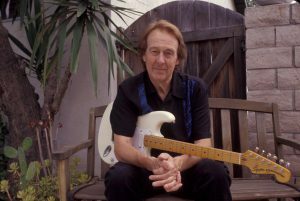 Hailing from Wales, Spencer founded the famed Spencer Davis Group in 1963, producing a dozen top 10 hit songs, including „Gimme Some Lovin“, „Somebody Help Me“, „I’m a Man“, and „Keep On Runnin“, helping to bring British rock ‘n roll to the rest of the world. Starting out with degrees in modern languages from the University of Birmingham (with fluency in German, French and Spanish), Spencer left his teaching career to begin his music career in Birmingham, recruiting drummer Pete York and brothers, Muff and Steve Winwood. Davis performed on guitar, vocals and harmonica. By the end of 1966, the group had numerous rock hits, including Gimme Some Lovin and I’m a Man, these two songs became their best-known successes, especially in the U.S.
Touring with the Rolling Stones and The Who when they were still working clubs, having after-hour drinks with The Beatles, jamming with John Baldry, Charlie Watts and Long and Jack Bruce were heady days for Spencer. When the hits started to come one after the other, his momentum spurred major US success. Check the concert itinerary and be on the lookout for the band to come your way!